Frilight Spring Clip equipped Nova 8778 12V-24V LED boat light sports the original Nova look and brings a handy spring clip installation to your cabin walls. Choose a trim ring color, bulb type and whether or not you want a switch. 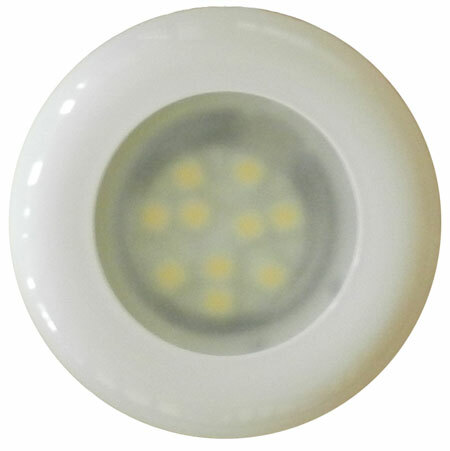 FriLight spring clip mounted Nova 8778 recessed, plastic cabin light with frosted lens and optional switch. Diffusing lens provides a discreet beam of light that also has a remarkably subtle yet illuminating lighting profile. 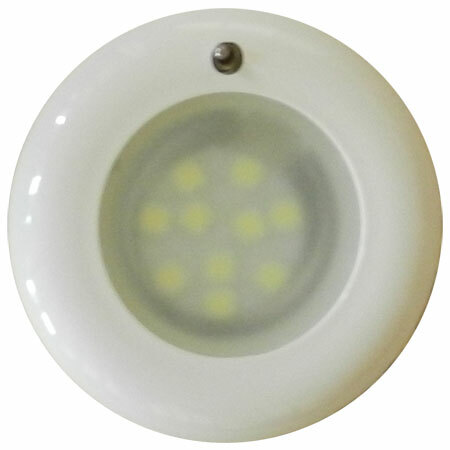 Select energy efficient 12 SMD G4 LED or G4-pin Halogen Bulb. LED functions on inputs of 10-30 volts DC and Halogen functions on a 12 VDC input. These lights came as original equipment on my Jeanneau. I had to replace one that had failed. One of the soldered wires had broken off right at the switch with no way of re-soldering the wire back in place. The only bothersome thing about these lights is the pricing strategy. If you go with the LED variant, then add a chrome trim ring, the original price rapidly shoots up to over double the advertised cost. Small complaint for an otherwise worthy product.